Today Russia have come to understand that migration and Islam are closely inter-connected, and if one disregards this connection, country can face serious problems which Europe has already encountered. Even a few years back while specialists in Islamic studies, ethnologists, demographers and other scholars dealing with the problems of Central Asia were talking about the correlation between the “Islamic factor” and labor migration in Russia, practitioners, officers of the Russian Federal Migration Service (FMS) for example, shrugged their shoulders and asked: “What’s the connection between the way a Moscow yard cleaner is sweeping the courtyard and his religious faith?” Yet today we have come to understand that migration and Islam are closely inter-connected, and if one disregards this connection in the context of unfavorable demographic prospects in Russia, we can face serious problems which Europe has already encountered. Where Has the “Islamic Factor” Come From? How has the notorious “Islamic factor” emerged in migration processes? Russia as well as Central Asian republics are the products of the USSR where the attitude toward religion was negative, to say the least. Islam managed to adjust itself to different social conditions and retained a significant number of its adherents. At the times of the USSR Islamic tradition was much better preserved in Central Asia than in the Urals-Volga region. First, the periods of time during which these regions were constituent parts of Russia are incomparable. Second, Muslims of the European part of Russia were a minority while in Central Asia they represented the majority of the population. Third, despite severe repressions against the Muslim clergy in both vast regions, in the Urals-Volga region the tradition of spiritual education was almost lost, while in Central Asia many imams were secretly teaching Islam, Arabic and Sharia law to younger people. Besides, that was the only place in the USSR where official Muslim religious schools were functioning – secondary Muslim Miri-Arab madrasah in Bukhara and the Islamic Institute in Tashkent. According to the opinion polls held by the US Gallup Organization in 2011 the proportion of the population who believe that religion is an important part of life was 34% in Russia, while in Kazakhstan it was 43%, in Uzbekistan – 51%, Kyrgyzstan – 72%, Turkmenistan – 80%, and 85% in Tajikistan respectively. Regrettably, sociological research of the migrants’ devoutness has not been held in Russia. However, according to the statistics of the Russian Federal Migration Service of August 2011 г., the proportion of migrants who have come to Russia from traditionally Muslim countries is 40.95%, which illustrates the intensity of the wide-scale phenomenon we have to deal with. Politically, Islam is perceived by some local inhabitants as a platform which allows the creation of a fundamentally new society based on the principles of Islamic justice. It entailed the process of politicization of Islam and its application as an ideology in fighting “faithless” regimes. The examples are plenty: Namangan of 1990, civil war in Tajikistan of 1992-1997, unrest in Andijan of 2005, explosions in Southern Kazakhstan in summer of 2011. It all created the situation that starting from mid-1990s the religious sphere has been put under strict control of the state. Today, for security reasons, mosques, imams and madrasahs operate under vigilant oversight of the state authorities. There is no wonder that members of the Islamic opposition facing criminal prosecution back home are seeking refuge in Russia in the general flow of labor migrants where one can get lost and continue political activity with impunity. Many faithful migrants arrange preaching areas at their working places – musallah. They are to be found in many Russian marketplaces. Some natives of Uzbekistan, Kyrgyzstan and Tajikistan even occupied the posts of regional muftis in the Urals-Volga region. Namely Russian Muslim clergy was the first to recognize the problem of the “Islamic factor” in migration processes because a mosque is a habitual and, one might say, a “dear” place to migrants from the countries of Muslim culture. Naturally, they seek and find support in the mosque as no one is dealing with the problems of migrants save a number of public and community organizations. Therefore, Muslim spiritual leaders had to accept responsibility of resolving the problems of Muslim migrants who in the 2000s became the majority of their parishioners. Muslim clergy regularly attend sessions of public consultative councils with the regional departments of the Russian FMS (or are members thereof). Many of them are actively contributing to the improvement of everyday life, working and living conditions of the migrants, to their social and cultural assimilation in the Russian society. The key idea backed by religious activists is to integrate the new arrivals first into the Muslim community and then into the Russian social medium through preaching, mosques and madrasahs. Bodies of Russian state power have realized the importance of the idea and the necessity to enhance cooperation with Muslim organizations for the purpose of social and cultural assimilation of migrants, too. Thanks to mufti Ravil Gainutdin (head of MSC of the European part of Russia) the issue of labor migration was raised at the meetings of President Dmitry Medvedev with the leaders of Russian Muslims, and it was projected locally at the level of plenipotentiary representatives of the RF President in Federal Districts and heads of Russian Federation entities. In 2011 the Russian FMS has started active cooperation with Muslim organizations. It was launched at the meeting of Service head K.Romodanovsky with mufti R.Gainutdin. At the turn of 2011-2012 regional departments of the Russian Federal Migration Service signed agreements of cooperation with the MSDs of Dagestan, Krasnoyarsk Territory, Stavropol Territory, Adygei, and Rostov Region. They also reached understanding on cooperation with Muslim organizations of the Sverdlovsk and Nizhny Novgorod Regions as well as other Russian regions. The essence of the agreements is that the centers of migrant assimilation will be established at the mosques combining the execution of functions of legal assistance to migrants, education in Russian legislation, customs and traditions, Russian language classes. It is yet difficult to outline the configuration of those centers. But there is no doubt that the guideline has been set up correctly. 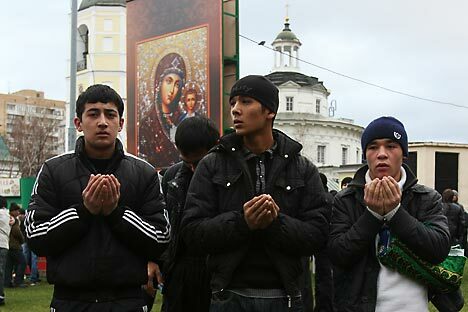 Who, if not Russian Muslims, would be able to understand and to help their brothers in faith from Central Asia in finding their feet in Russia? The mechanism of adaptation of Muslim migrants can be arranged as follows: as it was mentioned above, adaptation centers for migrants should be established at the mosques with due support of state authorities, public and, probably, community organizations. First, they have to provide free Russian language classes for foreigners to all comers. Second, consultation and resource centers can be established at the mosques where Muslim migrants can obtain written rules of behavior of a migrant in different situations, get legal advice, assistance of a human rights activist or even of a local immigration officer. Third, if a Muslim religious organization has adequate facilities, it can establish centers of temporary accommodation of Muslim migrants. Such centers would compare favorably with private or government establishments because a Muslim migrant will be able to find there sincere understanding of Russian brothers in faith who could coach him/her to live in Russian environment better than anybody else. Probably, it is the only way to avoid the problems tormenting Europe for a number of decades already.